This weekend, Judi and I joined our children in the Quad Cities, David’s adopted home, for a new tradition of enjoying their many pre-holiday events. If you haven’t been, I recommend it. All weekend, the two of us sat in amazement in the presence of our children. I know David and Kathryn are no more amazing than millions of other emerging young adults, but since they are my children I demand the right to be in awe of who they are becoming, and speak of them as if they truly are God’s gift…because to me they are. What can bring me to my knees, is wondering why I have been given the gift of them in my life. After expressing my disbelief on a social media page, a dear friend commented, in part, “Seems to me ‘everything’ you and Judi did explains their beauty.” I appreciate the generosity, but I see little way my efforts can explain the beauty in front of me this past weekend. As hard as I tried, as much as I wished to be a perfect parent, I grieve over the endless times I failed. I am saddened by the hundreds of times they longed for a listening and compassionate ear, and I found it necessary instead to attempt to fix or teach. I lament how often the stress of my life intruded on theirs in the form of unjustified anger and frustration. I mourn the lost opportunities when a different kind of attention would have nourished them in more abundant ways. And yet, in spite of my failings, they emerge as caring, compassionate, fervent young adults. 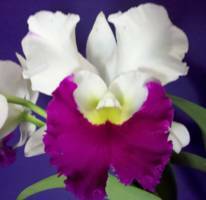 Judi has a growing passion, and a passion for growing, orchids. Last week, after more than a year, she coaxed one of her plants into rewarding us with three absolutely gorgeous blooms. They are stunning. And while I do not want to demean the loving care Judi gave them, their beauty is far greater than the effort to raise it. A bit of care, some water and a nourishing environment yield a thing of stunning beauty. The orchid rushes forth, becoming what it was always intended to be so long as it has a healthy environment and nothing gets in the way of its journey from seed to blossom. The magnificence of the blossom is contained in the tiny seed from which it grows. No matter how hard she might have tried, no matter the extent of her care or the nourishment she provided, Judi could not coax the plant into producing roses. Anything she might have done to try would surely have damaged this thing of beauty. When people tell us we did a wonderful job raising David and Kathryn, I usually reflect that if we did anything well, perhaps we stayed out of their way just enough. We tried to provide a loving, nourishing environment, but we always knew they had to blossom into the amazing humans they were intended to be; an orchid if it was their birthright or a rose if that’s what was implanted in their soul. So why have I been given the gifts of David and Kathryn in my life. Maybe, just maybe, they weren’t put here for me to be the teacher, but the learner. Perhaps they are in my life to teach me something about the unimaginable mystery, miracle and beauty of this Universe. This weekend was a magnificent lesson and I am grateful beyond words. “Innocent until proven guilty” is the most fundamental principle in our court system, but I wonder how often this critical precept wends its way into our day-to-day discourse. The possibility that this cultural tenet is lost in everyday life became painfully obvious during the recent mid-term elections. In the oft-violent language of the pre-election debate, those who fought for various opposing sides were frequently categorized as ignorant, idiots, or even evil—guilty without the slightest interest in the possibility of innocence. I know people on both sides of many of the issues, and they are good citizens who endeavor to do the best they can for our collective futures. They are not ignorant, idiots or evil. Our disregard for the principle of innocent until proven guilty is related to another thought that swirls in the gray matter I use to think about life. Is the use of question marks a lost art? If you mentally recreate the debates that erupted in the weeks before the election, you will likely recall few serious questions—questions without an implied answer. Questions like “Do you really expect us to believe those lies?” do not fall into my definition of serious. Serious questions open possibilities; periods shrink the potential for a truly new future. Serious questions seek wisdom; periods indicate that the knowledge we have at the moment is complete and final. Questions are future oriented; periods point to the past. In spite of their generative nature, I fear we have lost the art of asking truly great questions. Asking questions, acknowledging we do not have answers, is difficult. Allowing ourselves to be vulnerable can challenge our sense of self. Perhaps the world has shifted since I sat in the classroom, but I seldom received grades for the quality of my questions—and their ability help explore the as-yet undiscovered. My grades were based on the finality of the answers I conjured that ended debate and creativity. My grades, and the future they determined for me, were calculated by the deemed correctness of thousands of words that preceded endless periods. I have little doubt that, as the founders of our democracy deliberated the dictates and edicts of King George, the same virulent discourse, with an equal disregard for questions, dominated many of the debates. There will always be a time, as we disagree about what is truly fundamental about being human, in which our emotions will get hijacked and we will use too many periods…and some will loom very large in our conversation. But I wonder if, in the court of our day-to-day lives, we might practice replacing some of our periods with question marks. I know I will try. The following appeared recently in Neighbors of Batavia Magazine. I do verklempt about as well as anyone. Recently, the Chamber of Commerce recognized 18 professionals, under the age of 30, at our first annual “20 Under 30” dinner. It was a night filled with emotion as these extraordinary young leaders gathered with the senior leaders who nominated them, and a plethora of proud parents, friends and relatives. As is often the case, when in a place imbued with meaning, I became verklempt—choked with emotion. I realize as I write, that the words we use seldom communicate their true importance. It is the emotions animating those words that do. As I introduced the honorees that evening, what brought tears to the eyes of those in the room was not what these young people accomplish at work; it was hearing that collectively they canoed 2300 miles to raise money for cancer research…spent their free time with Big Brother and Big Sisters, and Feed My Starving Children… dealt daily with people struggling mightily to find a reason to continue their lives…tutored the students at Mooseheart…were instrumental in bringing art and beauty to Batavia and so much more. It was their generosity and giving nature that invited everyone to explore the meaning of verklempt. That night I used an icon, created by Italian psychologist Gaetano Kanizsa in 1955, as a metaphor for how we construct meaning. I asked the guests to decide whether the black or white triangle was larger. The majority concluded they were the same size. Then I asked how many noticed there were no triangles in the picture at all. That brought a smile to many faces…and frustration to others. We owe our survival, as individuals and as a species on the brain’s ability to extract bits of data from the environment and use that limited information to construct complete pictures and draw conclusions. If not for this ability, we would be unable to, upon hearing rustling in the woods, construct a picture that includes the possibility of a dangerous snake in our presence. It is this ability that, when we see a green light turn yellow, enables us to conclude a red light is likely to follow. It is this ability that allows us to see a few facial features on a loved one and inquire if they are troubled about some aspect of their life. Unfortunately, we are so adept at moving from disconnected images to complete pictures that we can fall into the trap of believing the pictures we create are accurate beyond reproach. If I am not careful, by looking only at certain aspects of young people as they enter the workplace, I can construct a less-than-flattering picture of who they are. Doing so is disrespectful, dishonest and distasteful. Most forms of prejudice emerge from our unwillingness to question the inaccurate pictures our minds complete of others…using disconnected bits of information to pre-judge them. There is a Buddhist tradition that says, if we were to look deeply into the souls of those around us, we would never get anything done…we would spend our lives bowing to one another. We took the time at our recent dinner to look more deeply into the souls of 18 emerging leaders and create a more accurate picture of their wholeness. It left me in awe…it left me with the desire to bow in their presence…and it left me verklempt.